The Minstrel model has all the essential features of a larger French style instrument without the higher price. 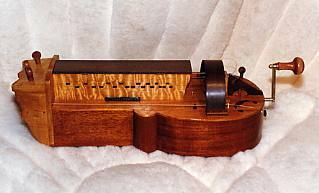 It has a full chromatic keyboard and the trompette (buzzing bridge), so it is the ideal instrument for a beginner who wants a full-featured hurdy-gurdy. The scale length and key spacing is the same as our larger hurdy-gurdies, so you can learn on the Minstrel and transfer your skills easily to another instrument in the future. The Minstrel is quieter and more compact, making it an excellent hurdy-gurdy for vocal accompaniment and for travel. It is easier to keep tuned and adjusted than the larger instruments, and is very stable. It's also very resistant to abuse: one survived having a pail of water dumped over it by a prankster (please don't try this at home)!